The position has been filled for the role of Administrative Assistant. We would like to thank all applicants for their applications, and welcome you to keep an eye on our Twitter and Facebook for any upcoming vacancies. Loop Foundry, a software development consultancy based in Hobart, is looking for a casual administrative assistant to join their small team. Edit (and contribute to) documents such as software documentation, project proposals, website blog posts, and operations manuals. Answer phone calls and respond to emails on behalf of other staff members. Perform software usability testing (if you think you’d be terrible at this because you know nothing about software testing, you’re exactly the person we’re after). Pester staff members (mostly your boss) to get the work they promised to clients done. Follow up with clients via phone and email to ensure they also do what they said they’d do. Perform Internet research and write summaries of findings. Basically, we want you to help us provide excellent service to our clients. Excellent general computer skills (experience in Word, Excel and PowerPoint is a must). The ability to learn quickly and follow directions. The ability to work unsupervised. Attention to detail and pride in your work. The lunch room (including ping pong table)! Total working hours will start around 8 hours per week. Your hours can be negotiable in order to fit around other commitments you might have. You’ll be paid $24.30 per hour ($19.44 plus casual loading) as well as superannuation guarantee contributions of 9.5%. 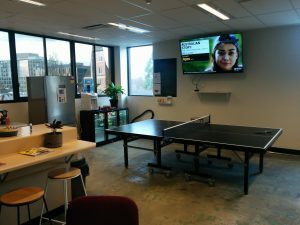 We have a lovely dog-friendly office space in central Hobart (with table tennis table and large kitchen). You can work from home occasionally if needed (though you’re expected to be in the office most of the time). To apply to be our new administrative assistant, please email your CV (or a link to your LinkedIn profile) to [email protected]. Cover letters are welcome and encouraged, but you will be disqualified if you attach the cover letter as a Word or PDF document rather than put it in the email body. Applications will close on the 15th of September. Applicants will be notified via email within two weeks as to whether they have an interview.